A few 2004 Italian Paintings by Stephen Quiller are still available for purchase, and they are listed first. However, we welcome you to enjoy viewing all of the paintings, Stephen's introductory description to his Italian painting tour, and his reflections on the inspiration for each painting. How incredible to one day visit Michelangelo's Pieta at the Museo de Opera Duomo created when he was eighty years old and with such power and emotion. How incredible at night to go to a concert at St. Mark's English Church and listen to arias from operas and piano concertos by magnificent talent. How incredible to take that energy and each day go to special place and paint, simply paint for the day. I see this trip now as a four-month concert. There are the crescendos when I explode into a painting. 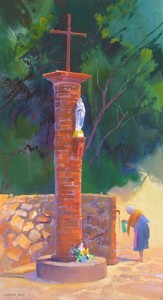 There are the quiet etudes when my brush caresses sensitively the paper while painting a very quiet and spiritual piece. There is the opening and introduction, the interludes and the climax and conclusion. There are the different instruments, the major and minor chords, the discord notes. Four months is long enough that you get acquainted with the people, the culture, the pulse and the beat of the area. You see seasons change, the harvests and plantings, birth and death. This exhibition is my concert. Pienza is a small hill town in the south of Tuscany. I spent some time here in the center square after there had been an Italian wedding. The wedding party and guests were in the square taking photos. The priest ambled among the crowd chatting, hugging, and giving blessings. At times he would distance himself from them and wander alone. I did a few sketches of him and also of the old Roman well which is at the center of most Tuscan villages. I went back a few days later and set up in the square which at this time was much more quiet. 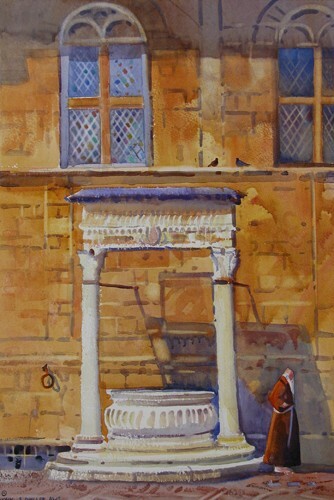 I wanted to capture the light and texture of the stone walls and the feeling of the Roman well. Of course I placed the priest at lower left lost in contemplation. A rich tradition in this village is the evening walk, una passeggiata. At 7:00 PM the church bells ring dramatically and long and it signals that it is “time”. People from all walks of life and of all ages stroll slowly up the street to the center square and back. People greet each other. Many are very nicely dressed. Traffic is not allowed on this large avenue and so everyone ambles back and forth. I viewed this each evening from my hotel window, the Hotel Grande Italia. I then sketched and when my workshop was over spent a couple of days in this room seeking the mood for the subject. I wanted umbrellas. At the first hint of rain umbrellas popped out everywhere. This captures the clean late light after a rain. I found this tabernacolo at a small out of the way church in Tuscany. 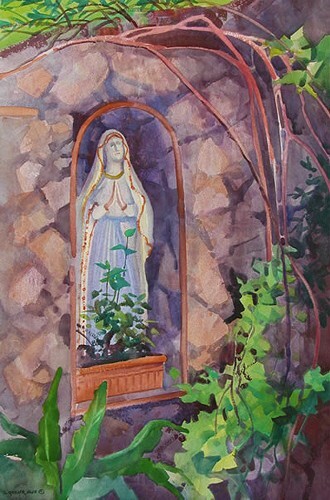 Many of the churches of the area have these niches in a wall beside the church and have plants, flowers and many times light candles as a prayerful tribute to the Madonna. I had wanted to do a painting using this subject for a while and this seemed like a contemplative day to start it. I took it a good way but it was still unfinished. A few days later I took the time to go back in the morning and push on. There were subtle color tones in the figure in the shadow, a challenging work. 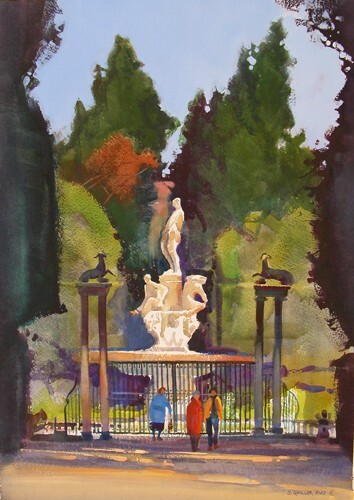 I have dreamed for the last two years of painting in the Boboli Gardens. John Singer Sargent painted there over one hundred years ago and that is what brought me to it. But it was not easy! 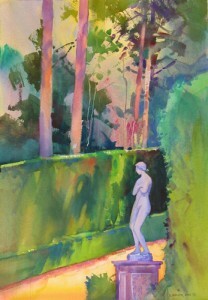 The first day that I arrived I went to the gardens and asked if it was possible to paint in there. I was told that I needed to write to the director for permission, which I did. It took two weeks before I received notice. I did this painting of one of the typical sculptures, but what attracted me to the subject were the light and shadows, and the beautiful tree patterns that accentuated the rhythm of the composition. Two workers who were gardening and pulling hoses kept coming by to check things out and gave me the thumbs up. Via Michelangelo is a windy, twisty avenue that skirts the hill at the edge of Florence. On the west side it runs into Porte Romana, a central point to access the old town. The avenue is lined with plane trees that are like our sycamore with wide sidewalks on either side and old, beautiful villas, hotels, and parks. 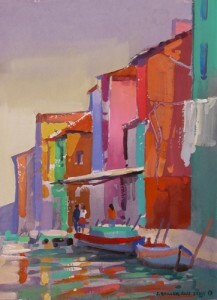 There is beautiful color, light and shadow, and paintings everywhere. While I was painting this composition, an older woman came by strolling a baby. I did some sketches of them. It is very common to see grandmothers taking care of their grandchildren and so I felt it was important to include these figures in the painting. There are a number of fountains in the Boboli Gardens, and one of my favorites is the Fontana Del Forcone which has the figure of Neptune at its zenith. John Singer Sargent had painted some of the statues in these gardens one hundred years ago, and that is what had initially brought me here. However, I was most interested in the autumn color against the color of the figure. 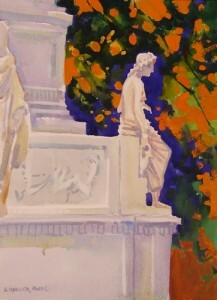 The foliage that draped the crown of the painting was on the path where I set up. These gardens are a haven from the constant activity of Florence that is outside these walls. It is a beautiful place to paint. 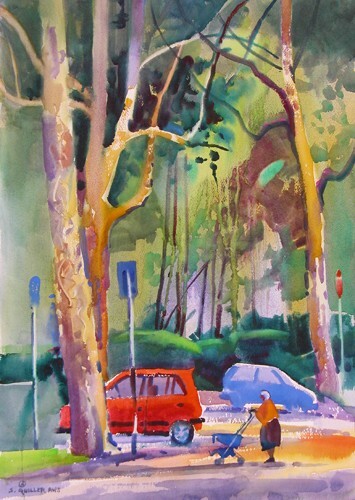 The subject for this painting is a beautiful park in the suburbs of Florence. All autumn I viewed this grove of trees from a distance as we would drive into the city. Finally I took time to explore this place partially by making a wrong turning and then rerouting. 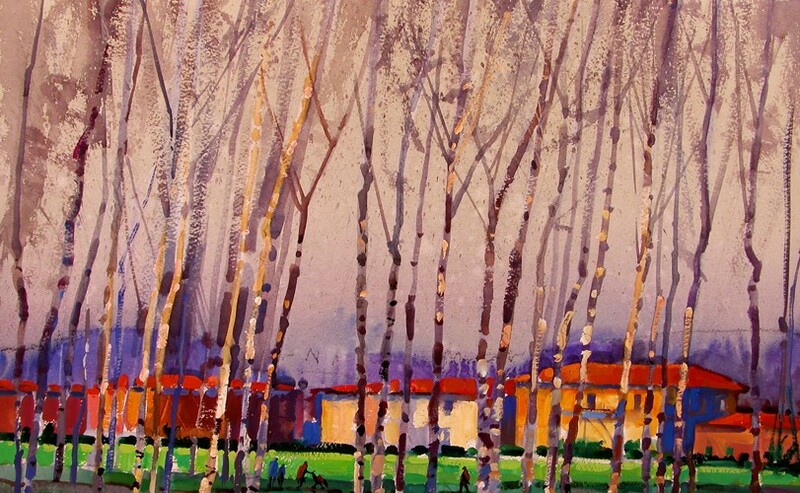 These are giant alder trees that look similar to the aspen I am used to painting in Colorado. I set my easel by the side of the park and painted the Italian villa patterns laced and threaded through the openings of the trees. I was interested in the beat and rhythm of the trees, syncopated against the backdrop. Many people from apartments nearby use this park for walking and a place to stroll their dogs. One morning in mid December my friend Steve Willman and I went to check out a dock and a place we had located to paint. After viewing the site in daylight we decided to move on. 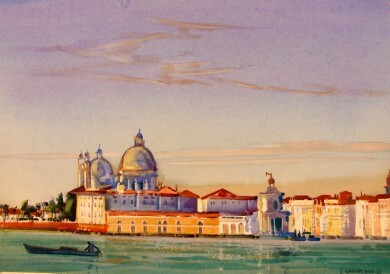 I noticed the island of San Giorgio, and it looked as if it would have some great views and seemed less traveled. We took the 82N ferry to the island and spent the day painting. The light was low and long but we spent most of the day painting in sunlight and stayed reasonably warm looking at the view of Santa Maria della Salute. 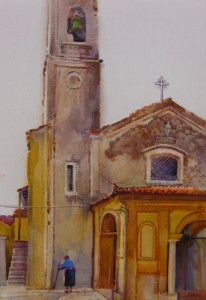 This church has been painted by many artists, among them Turner and Sargent. Bagno Vignoni is an old Roman village with hot mineral baths. The town is quite small and is easily accessible by foot. In early September most of the rolling fields are plowed and the villas and cypress stand stark against the earth. 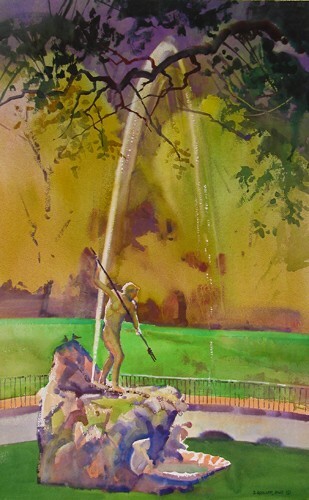 Painting in the open air this time of year is not easy as the sun is direct and relentless. I was inspired by the light and shadows on the villas and the strong diagonal that breaks this composition. This was the first painting I did on this four-month painting trip. Bagno Vignoni is an old Roman village located in the hills of Tuscany known for hot mineral baths. The Romans would visit these spas, about one hundred and twenty miles from Rome, to relax and soak and heal. At this site there is a large stone-walled bath in the center of town. 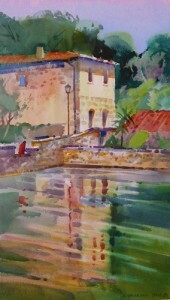 I stood at the south end under an arch in the shade while painting some of the village patterns and the reflections in the water. I did this painting at the same site where I did the first one on this tour. Bagno Vignoni is an old Roman village with hot mineral baths located in the hills of southern Tuscany. The Romans would visit these spas, about one hundred and twenty miles from Rome, to relax and soak and heal. I learned a lot from my first piece and decided to do this larger painting in watercolor and gouache. In September I see Tuscany in ultramarine and gold. The umber and sienna plowed fields are set off by the thick blue haze this time of year brings. 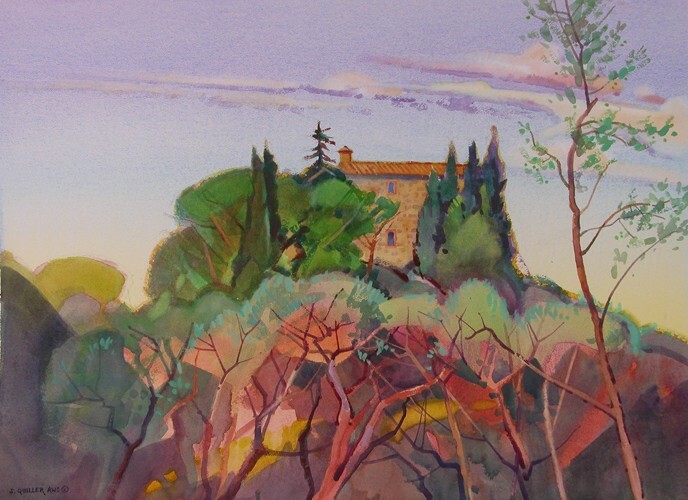 Montepulciano is a hilltop village in Tuscany that has a population of approximately 40,000. Winding up toward this city, panoramas open between trees and villas, and at the city's edge there is an incredible display of field patterns, vegetation, and farms. There is also a beautiful bird's eye view of a cathedral that is breathtaking. I was inspired by all of the diagonals and the complex nature of the composition. It was also a steamy-hot day with little shade. The high humidity actually worked in my favor and the paper and paint dried slower giving me more time to work the brush and manipulate the paint. Then, at the end of the day I packed up and finished the work away from the site. 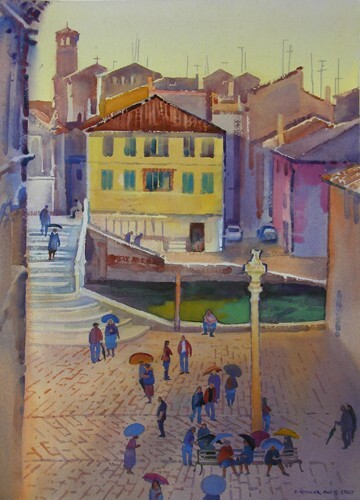 My workshop group and I arrived at the beautiful fishing village of Chioggia on September 8. I would stay there a total of eleven days. The first night I could not wait and ventured out to the edge of a canal next to the hotel to do a painting at twilight. 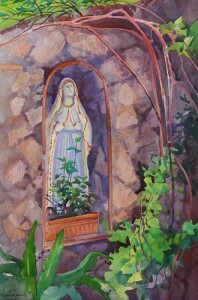 This was a challenging painting to do because as the light dimmed, it was hard to see the palette and the color mixes. I enjoyed the lights from the buildings and the dark shapes of the boats piercing into the light bouncing off of the canal. 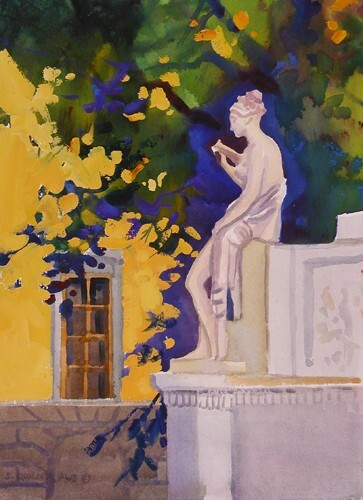 I took the painting further later in the studio where I could adjust the colors and the value that could not be deciphered towards the end of the plein air painting session. Winding along laundry draped allies and narrow streets, I came to the edge of a canal and the Sanctuario del Christo Church. In front of the church is a large gated yard as well as a public square. To the south is the main canal that the large fishing boats use to access the sea. On the other side of the water are high rise villas with laundry hanging. At the corner of the building is a sculpture of Maria and a street lamp. Above the sculpture is an ornate, gold umbrella-like protective covering that must symbolize a heavenly body. I liked the composition of the sculpture winding down to the two boats with the two Italian women lost in conversation. On the west side of the large canal in Chioggia there is a great view of the Sanctuario del Christo. The day before I had sketched this view and had thought what it would be like to paint the church with some ground fog and a flock of sea gulls. When the large fishing boats come through the canal, flocks of these birds activate and are like a cloud of piercing cacophony. 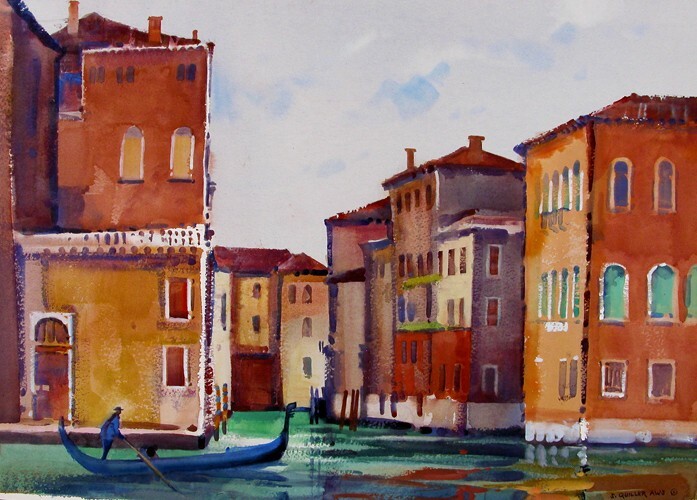 I began painting near the water's edge with just enough room to stay out of harm's way of small cars and Vespas. Italians walked by and one offered the words “gabbiani” for seagulls and “nebbia” for fog. Burano is an island not far from Venice and Chioggia, and is known for its lace making. 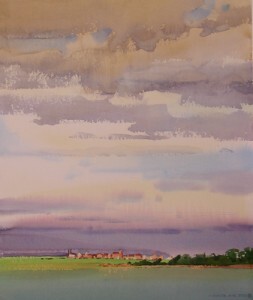 We took a ferry one day to the island and painted until 3:00 PM when it began to sprinkle. I found a side canal where there were no tourists and only locals coming and going. 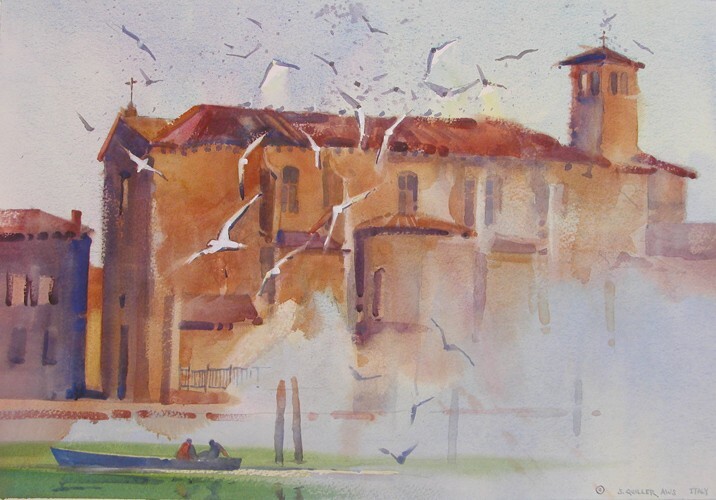 There was a small wedding that took place at a church not far from where I painted. 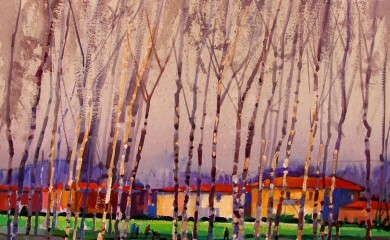 This village is noted for the rich, chalky multicolored houses and I tried to capture this with the painting. I did the painting with an undertone of watercolor and overlays of opaque gouache. Chioggia is a working fishing village that is close to Venice but without as many visitors. One of the characteristics along its canals is the aged texture of the walls and the rich colorful boats. I wanted to capture the contrast with this painting. I began with a rough textured paper and granulating watercolor paint to give the under-painting some texture and a feeling for age. 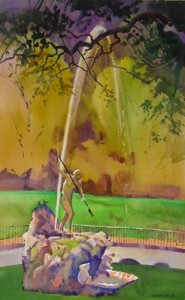 I then worked over this layer using casein with translucent and opaque applications. Casein has a velvety matte visual quality that has just the right feel for this subject. 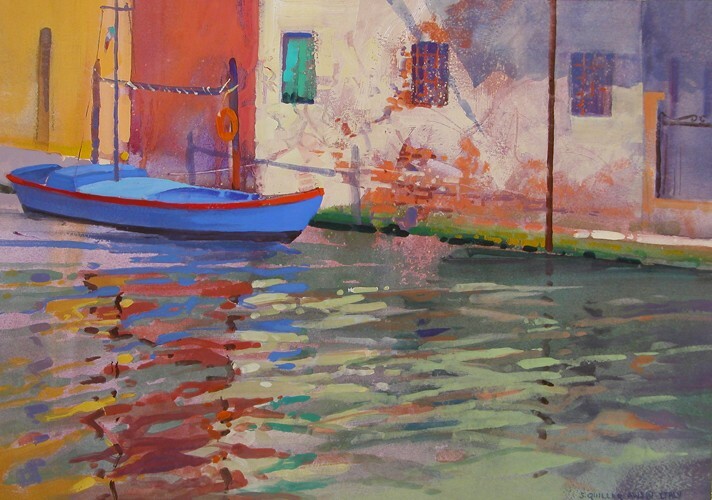 The true challenge of this subject is the movement and reflections of the water. One mid-September night around 7:30 PM I set up my easel across the canal from an old church. I started sketching the composition and began painting around 8:00 PM. I had studied the subject the previous evenings and thus knew how I wanted to do it. I also knew that the subject's color would change drastically in the two hours of work. The night sky would change from twilight to ink black and the lighting on the church would appear more golden as the night progressed. I anticipated color, contrast, and mood. It was so dark I could not see my palette. The next day I went back to the site and adjusted everything while retaining the original mood. On a bridge over a small canal in Chioggia I arranged my easel to do this small painting. For the previous week I had observed the life that happens on the various level of buildings along the canals and side streets. Morning windows, afternoon windows, and evening and night windows. 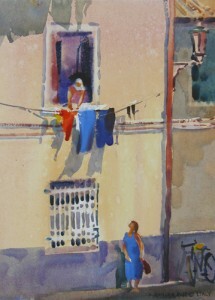 Here a lady hangs out some colorful laundry while a friend passing by stops to talk. This sort of thing happened all of the time and is the way of life in this fishing village. At the Hotel Grande Italia in Chioggia, I moved to a new room on the fourth floor. I was given this small suite to accommodate the arrival of Marta and Allison a couple of days later. 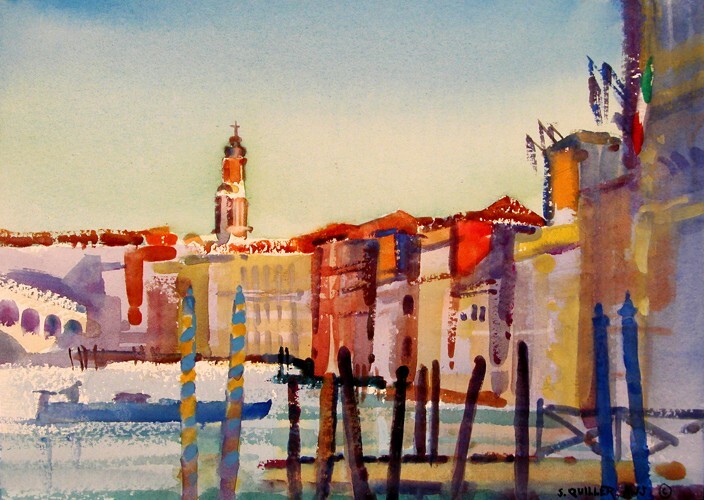 I lost one view of the center square but gained a view of the Venice lagoon and the village of Pellestina. It had been stormy and cloudy and that created an interesting light on the water and the long stretch of villages in the distance. In addition to the light, the painting captures an abstract horizontal banding and division of space. I worked with the windows open and the sound of boats, men working, and seagulls cawing. 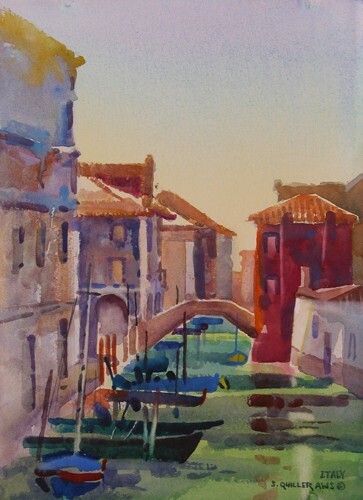 On my last full day in this incredible village, I placed my easel on the bridge overlooking a canal, wanting to capture the feeling of early morning light. Marta and Allie would be arriving by mid-afternoon so I had a quiet morning to paint. 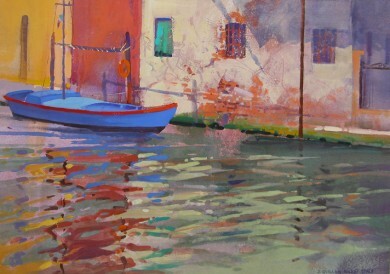 Boats occasionally came up and down the canal and tourists and locals stopped to watch me paint. This does not distract me as it used to. Rather I have now learned to let this energy come into my painting. This is a composition of essentially the same composition that I did the evening of my arrival, the view being only thirty meters apart. I arrived at our small villa between Grassina and Impruneta in the hills above Florence in mid September. Marta and I went on a walk and then a drive to see the property and the surrounding region. This is my first study of the area. 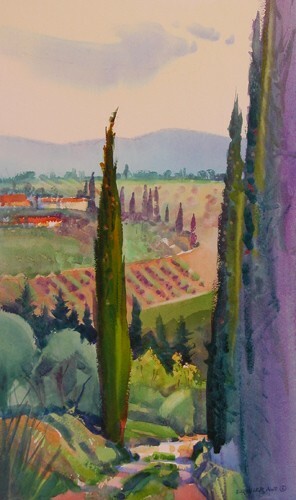 I wanted to capture the mood of the afternoon heat and the Tuscan sun against the cypress and the olive trees. The soft gray-green translucent color of the olive trees is very beautiful. I did the painting with watercolor and gouache. When I first arrived in the Florence area Marta took me on a drive and a hike to get me oriented. At a certain point we were at the Piazza del Michelangelo looking at the various views of the city. 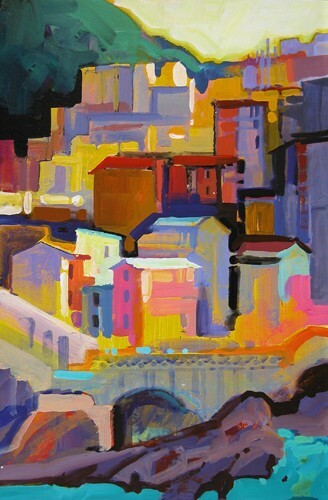 I particularly liked this view of the Ponte Vecchio, a famous bridge across the Arno River. A few days later I arranged my easel and palette and began painting. The view is in front of an outdoor restaurant. Many people came by taking pictures and talking of art. The painting was a challenge as there were thousands of roof tops and windows and the key was to simplify and get to the essence of the subject. I finished the work later in the quiet of our villa outside of Florence. 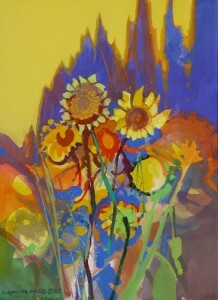 I have visualized painting sunflowers ever since we knew we were coming. 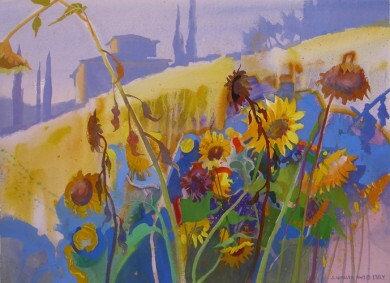 In 1994 I taught a workshop in Tuscany in September and we spent a day painting at a sunflower field. This time in my travels it seemed all of the fields were spent. However, I discovered below our villa one day a field with some left still blooming. I hauled all of my gear to the site as well as a table and a few flower vases, and began arranging these flowers in a wild still life with Tuscan fields and vegetation as a backdrop. I felt that casein was the ideal medium of choice. The visual quality has a look of the velvety matte sunflowers as well as the late September hazy blue atmosphere of this region. I have visualized painting sunflowers ever since we knew we were coming. 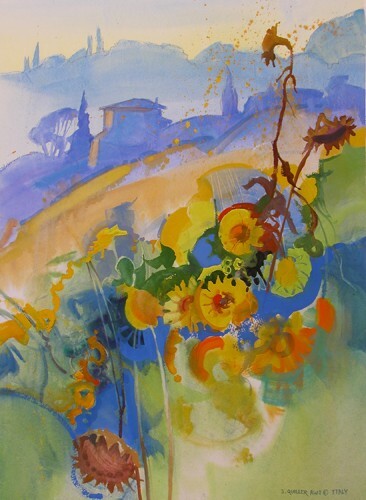 In 1994 I taught a workshop in Tuscany in September and we spent a day painting at a sunflower field. This time in my travels it seemed all of the fields were spent. However, one day I discovered below our villa a field with some left still blooming. I hauled all of my gear to the site as well as a table and a few flower vases, and began arranging these flowers in a wild still life with Tuscan fields and vegetation as a backdrop. I felt that casein was the ideal medium of choice. The visual quality has a look of the velvety matte sunflowers as well as the late September hazy blue atmosphere of this region. I have visualized painting sunflowers ever since we knew we were coming. In 1994 I taught a workshop in Tuscany in September and we spent a day painting at a sunflower field. This time in my travels it seemed all of the fields were spent. However, one day I discovered below our villa a field with some left still blooming. I hauled all of my gear to the site as well as a table and a few flower vases, and began arranging these flowers in a wild still life with Tuscan fields and vegetation as a backdrop. I felt that casein was the ideal medium of choice. The visual quality has a look of the velvety matte sunflowers as well as the late September hazy blue atmosphere of this region. This was the second large wild and free painting from this series. About a mile from our villa along an old narrow road is a small church that is simple and off the beaten path. Down from the parking lot is a secluded meadow that has incredible views of villas and the countryside. It also is a peaceful spot for painting. 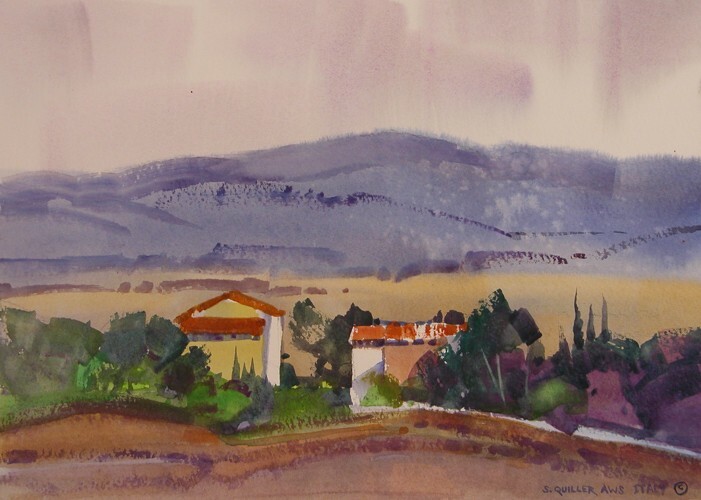 I set up my palette and easel in the shade on this morning and was most interested in the shape of the villa, cypress and umbrella pine on the hillside jutting up against the morning sky with the pattern of the olive groves below. 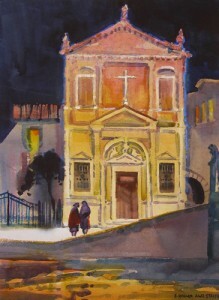 This church is located not far from the Michelangelo Piazza in Florence. It is up a hill next to a quiet and shaded park. 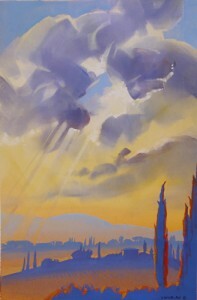 I had found this composition two weeks earlier when first arriving in Florence and could not wait to paint it. 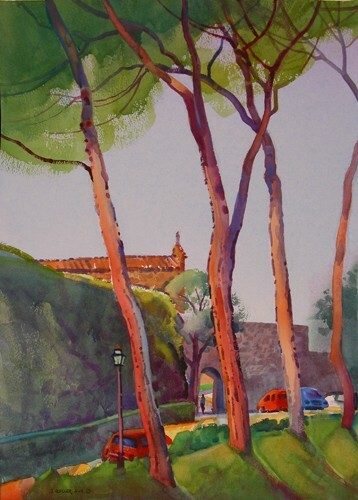 The curvilinear shape of the trunks of the umbrella pine provide the major beat and structure of the painting while the strong notes of color of the cars provides added interest. At certain times of day the monks could be heard chanting through the walls and there is a large beautiful cemetery on the church grounds. A few groundskeepers worked nearby throughout the day and came by occasionally to give some moral support. One day I went to a small plateau near our home to paint. From this spot there are great panoramic views of the countryside. I set up my palette and easel near some olive trees working with a small but interesting elongated format. The view to the upper left is of a small village of San Gersole, a place where Marta enjoys hiking. One day I went to a small plateau near our home to paint. From this spot there are great panoramic views of the countryside. 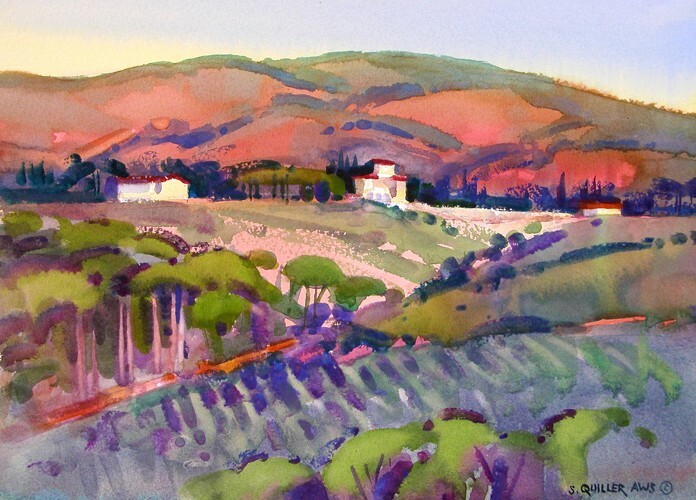 I set up my palette and easel near some olive trees and worked with a small but interesting elongated format. This was the second of two studies I did this day, and this time I was interested in the color of the soft cloud in the distance, wanting to capture the softness and haze of the countryside. I did this painting on one of Marta's favorite walking paths. The road turns into an ancient dirt and rocky trail. On close inspection at one time the stones were hand-laid to solidify the base. Off this path next to some olive trees I set up and painted. There was a haze in the air due to the burning of debris under the olive trees. 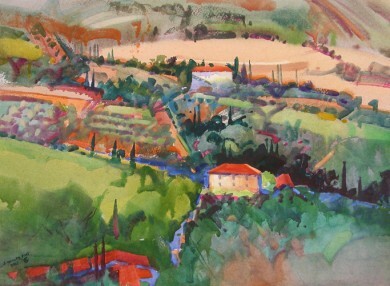 I pushed the color to express how I felt that day about the Tuscan landscape. At the end I washed a thin casein veil over the acrylic painting to capture the haze. The next day I pushed the painting further with casein in the foreground. One day I hiked along an abandoned road behind our house that was lined by cypress trees. I had my mind clear and although I was looking for something to paint I was actually listening as well as looking with “soft eyes”. At a certain point I turned around and witnessed this scene. It struck me the way the distant panorama was framed by the old dark cypress and at the base in light and shadow was this old road, telling the story of what had once passed by. 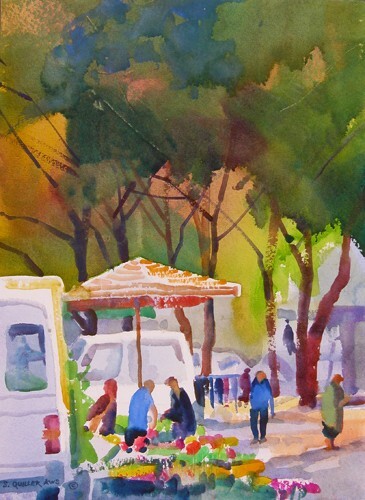 I worked in watercolor entirely to capture the light and mood of the day. I was set to go to a park next to the interior city of Florence but Marta needed to do some shopping in another outlying area. I decided to go her way and see what I could find close to where she parked. I was pleasantly surprised to find this Monday market day going on. 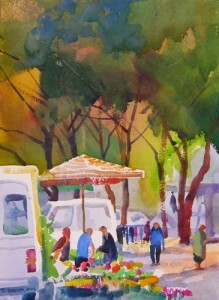 It was a quiet market, meaning that there were not so many people that it made it difficult to paint. 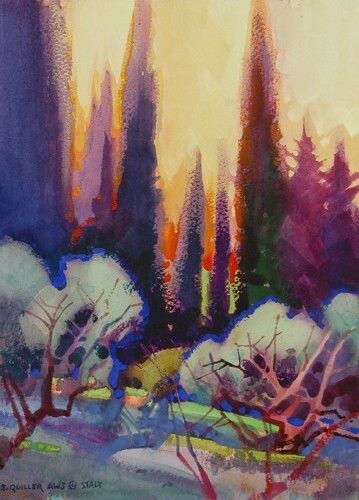 I focused on the flower stall and placed my easel in a quiet spot, painting the back-light coming through the trees. To get the figures in the painting I first did quick line drawings of many figures passing by. I then placed the sketch book in front of the easel and worked from there. 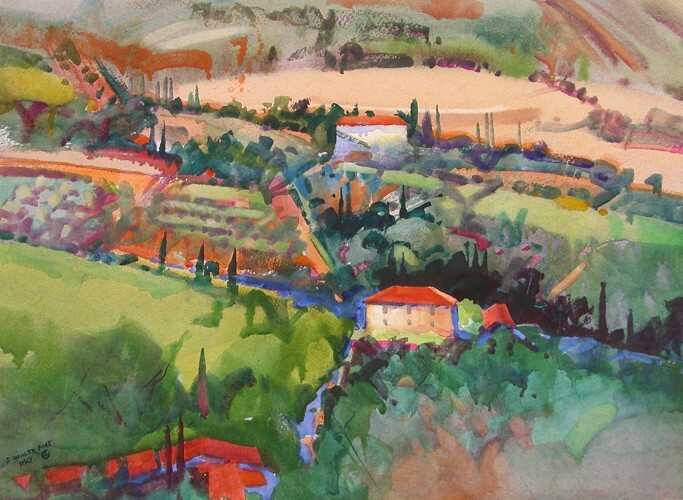 There are many small, old communities tucked away in the hills of Tuscany. Each of them has a small church to define their life-blood. One that “pulses” close by is the community of Quintole. It is down a dirt road one kilometer from the main drive with a small church next to an ancient olive grove. Marta and I explored the area one evening and experienced this powerful subject. The sun was a brilliant red-orange dancing through limbs of foliage and its color complemented the cool blue-greens and greens of the trees and grass carpet below. 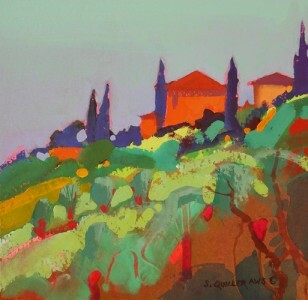 Two days later I was back for a full day of painting, setting up at the back of the church but facing this olive grove. Each morning we woke early to get Allison to the bus which came near our house about 7:10 AM. Thus I watched the dark become dawn and on most mornings there was a heavy atmosphere and humidity with low hanging clouds or fog. When the sun came through, this atmosphere was like a veil showing the landscape in layers. The most distant were the lightest in value and each closer layer became darker. There was also a cool to warm gradation with each layer. Many days the layers dissipated by late morning as it warmed and the sun got higher. Each morning we woke early to get Allison to the bus which came near our house about 7:10 AM. Thus I watched the dark become dawn and on most mornings there was a heavy atmosphere and humidity with low hanging clouds or fog. When the sun came through, this atmosphere was like a veil showing the landscape in layers. The most distant were the lightest in value and each closer layer became darker. There was also a cool to warm gradation with each layer. This morning there was an incredible sky with shafts of light piercing through the clouds. I chose to use a transparent acrylic underlay and then do the painting in casein. Casein seems to be the medium that best expresses the land at this time of year. One day we decided to explore south of Florence and took the road to San Gimignano. The village itself is very touristy. 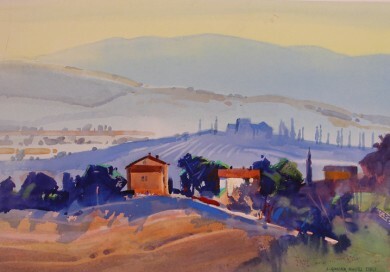 However, the town setting is in a very beautiful landscape region of Tuscany. Outside of this village were potential paintings everywhere. Marta let me out about a mile below the town where I had a beautiful view of the countryside. I was attracted to the color of the vineyards in early October as well as the pattern of the olive trees. The buildings on the horizon are part of a winery called Monte Oliveto. area. I decided to include her in the composition. 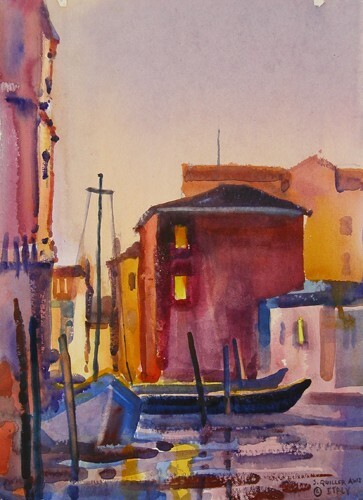 I did a sketch for this subject in mid September while teaching a workshop and spending the day on the small island of Burano. In mid-afternoon it began raining and I noticed in the city square people sitting on the benches, creating a beautiful pattern of the umbrellas. 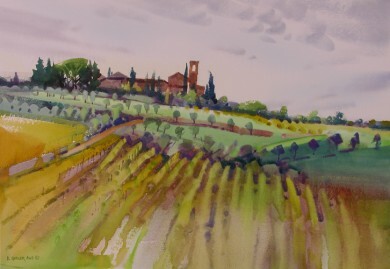 In mid-October in Tuscany we had a rainy and blustery day so I pulled out the sketch and did this painting. I did this painting about two miles from the villa where we were staying. 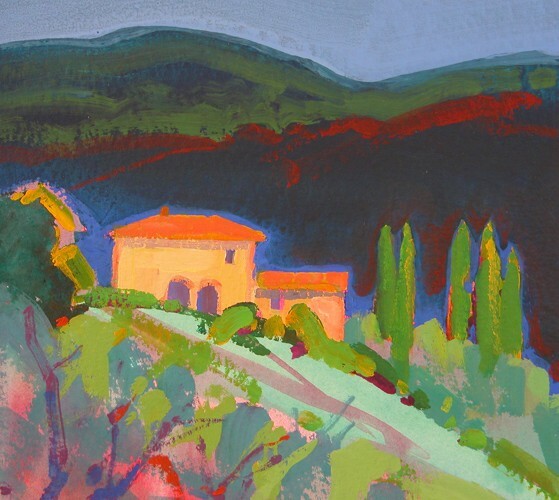 This is a property, or farm (fattori), that has fields of olive trees and vineyards. Their outlet was only open on Saturday mornings but this is where we purchased wine and olive oil. 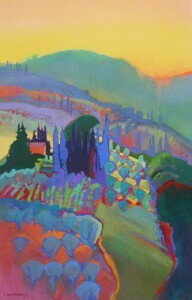 This day I painted with my friend Sue Patterson who was visiting from Alamosa. I worked in acrylic with transparent under-painting and opaque overlays. I did this painting about two miles from the villa where we were staying. This is a property, or farm (fattori), that has fields of olive trees and vineyards. Their outlet was only open on Saturday mornings but this is where we purchased wine and olive oil. This day I painted with our friend Sue Patterson who was visiting from Alamosa, Colorado. I worked in acrylic with transparent under-painting and opaque overlays. Quintole is a beautiful little spot with a church and a few houses not far from Impruneta. 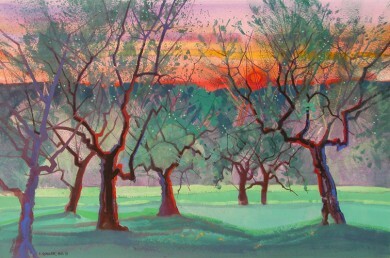 I had done a painting of olive trees at sunset a few weeks earlier from this same location. 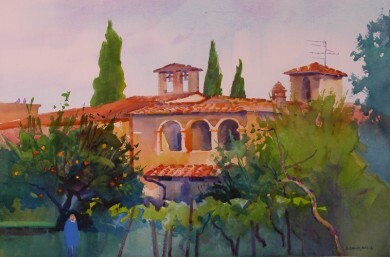 This time I focused on the back of the church and garden with a fruit tree and grape vines. Each day that I was at this location during the Italian siesta time (1:00 PM - 4:00PM) the caretakers would go to their quarters for lunch and would always turn on the TV and listen to the news. For that reason I felt it important to put in the antenna on the far right tower. San GiMignano is a beautiful walled village with fourteen towers placed around the city walls. It also draws tourist crowds. Outside these walls is a magnificent hilly countryside with beautiful olive groves and vineyards. 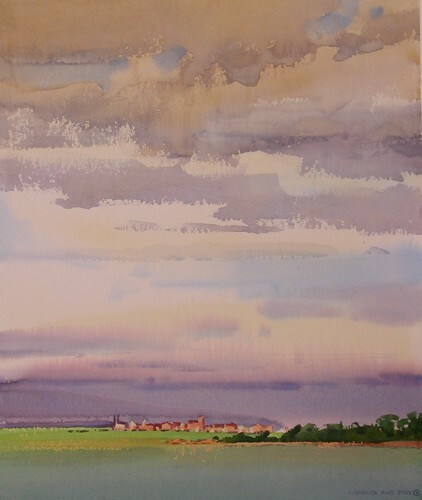 I placed my easel for this painting about one kilometer from the village and looked east, choosing not to paint anything architectural this day. I was after the haze of this October day with diffused light as the subject matter receded. I also wanted to get the rich color of the changing leaves of the foreground vines. From one selected parking spot we often used during our stay in Florence, we would stroll by Demidoff Park before crossing a bridge and going into the old city. 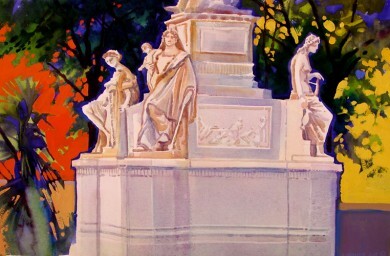 In this park is a magnificent monument sculpted for Conte Nicolo Demidoff. I do not know how many times I looked at this work before doing this study. One of the five major figures on this monument is “Truth”. I focused on this work in my painting and was also inspired by the foliage and beautiful colored walls and window patterns in the background. From one selected parking spot we often used during our stay in Florence, we would stroll by Demidoff Park before crossing a bridge and going into the old city. 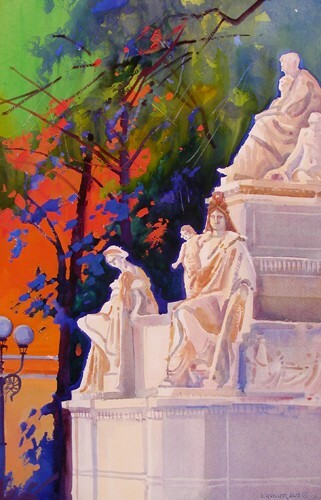 In this park is a magnificent monument sculpted for Conte Niccolo Demidoff. I do not know how many times I looked at this work before doing this study. One of the five major figures on this monument is “Muse of Festini”. I focused on this work in my painting and was also inspired by the foliage and beautiful colored wall and window patterns in the background. This monument was sculpted by Lorenzo Bortolini and Pasquale Romanelli between 1828 and 1850 for Count Niccolo Demidoff. He is placed at the top of the monument with his son and Gratitude with four images at the corners below: Truth, Mercy, Muse of Facini, and Siberia. It is located in a park near the Arno River where I park to go to the old city. There are some great, rich colored buildings surrounding the park with dark leafy foliage and stately trees and palms. I have found a wealth of material here with this subject matter and beautiful, sensitive transparents against strong bold opaque patterns. This is a study for a larger painting I titled “Umbrella, Persimmons, & Pigeons”. 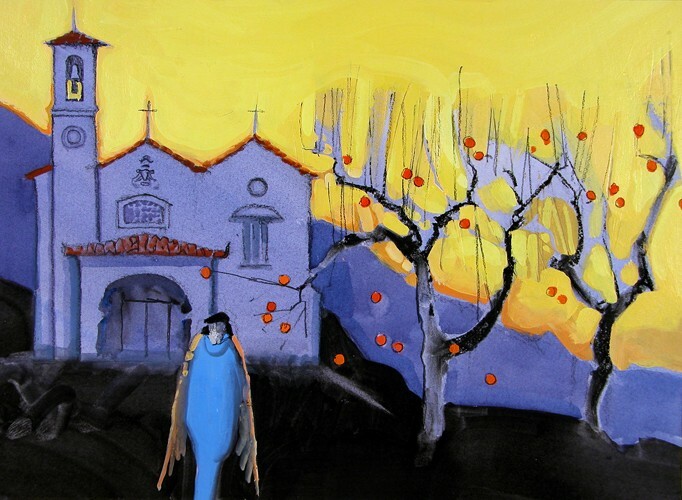 I had been to this rural church and noticed the bright orange persimmons on the bare tree branches in late November and December, reminding me of tree ornaments. I then met a priest who was very tall and ancient. He leaned over a fence and we talked, his face very cheerful. 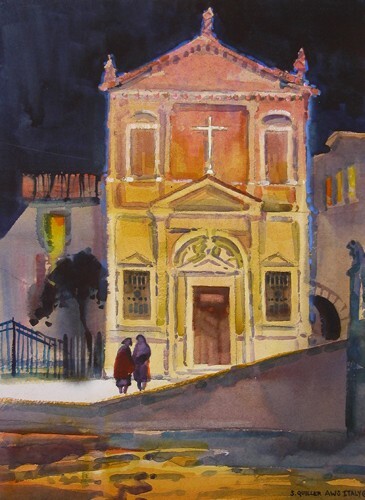 I then incorporated this experience into a painting using the façade of another church that is visually much more interesting. In the study the figure takes on angel wings that were there in a dream, motivating me to do this work. 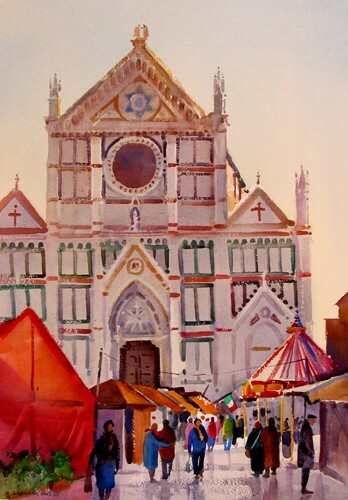 For three months I had wanted to do a painting of this Duomo in Florence. It is one of the largest cathedrals in the world and dominates the cityscape. 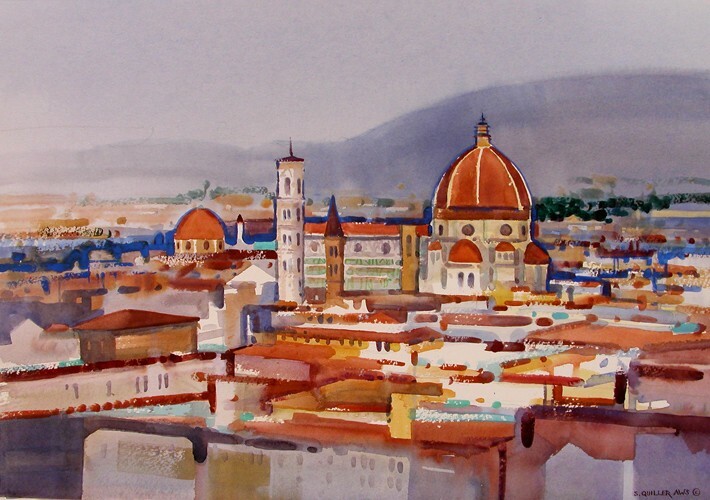 It can be seen from most anywhere in Florence. The dome itself is an architectural marvel. I found a view that I liked from the front of the San Miniato al Monte church, located on a hilltop above the city. It was a sunny day in early December with the blue haze defusing some of the distant shapes. I painted next to my friend Steve Willman who “took the brunt” of the tourists and school children who came by. I did a previous study that I titled “Persimmons & Chiesa Di San Guisto” to work out some of the thoughts for this work. I had been to a rural church and noticed the bright orange persimmons on the bare tree branches in late November and December, reminding me of tree ornaments. I then met a priest who was very tall and ancient. He leaned over a fence and we talked, his face very cheerful. I then incorporated this experience into a painting using the façade of another church that is visually much more interesting. 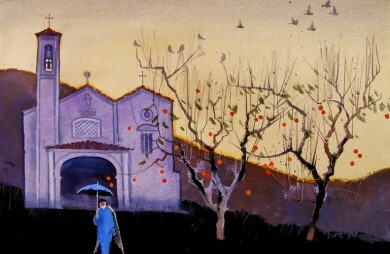 While working on the painting the pigeons and the umbrella became an important element in the composition. In December I spent some time in Venice on two different occasions. This day was a gray and misty day with some showers. I looked for any covering to work under and found a good spot close to San Marcos Square next to some vendors. It was a fairly busy place but once the painting was underway I was for the most part oblivious to the distractions. I wanted to capture the layers: first the island with the San Giorgio church and building patterns, then the gondolas with the rich blue coverings, and finally the people passing by. All in all it was a good day except for the time I was attacked by some pigeons when breaking a bit of bread to eat. 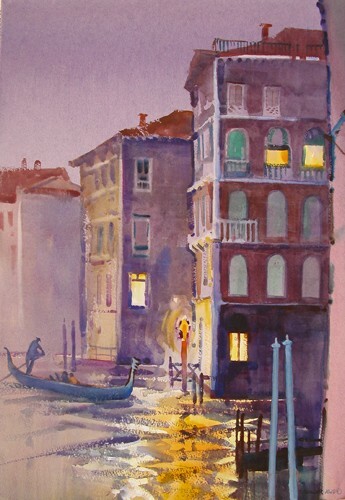 We stayed at a place close to the San Angelo Ferry stop in Venice. It is always difficult to find a place to paint along the water in this city. The docks may be private or an active public area with no room to set up, but this spot was good. I located in a fairly quiet corner and looked across the Grande Canal to a side canal that gondoliers kept going in and out of. I was very interested in the window and façade building patterns playing against the sky and water. I had looked at this church for a couple of months, hoping to have time to paint it. 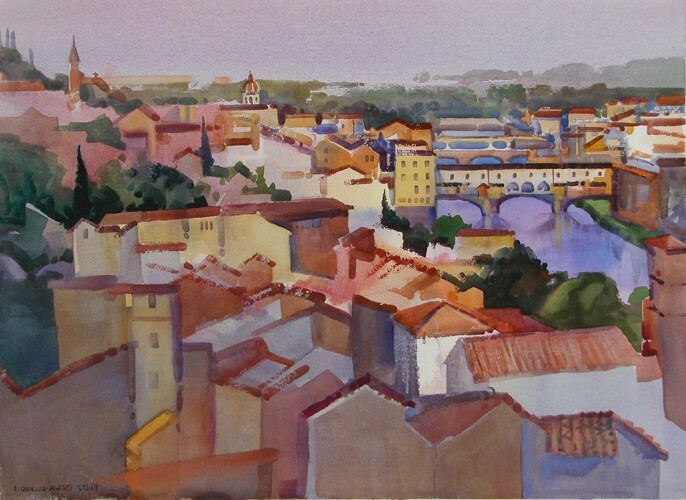 One day in early December I went to paint along the Arno, but the view I wanted had the sun directly in my eyes. So I decided to move inside the city and do Santa Croce Church. There was a Christmas Market in the square, featuring German products. During the day I had some bratwurst and kraut, then strudel, one of the advantages of being a plein air painter. I had spent a lot of time in the Boboli, an important garden that was part of the Pitti Palace. In early December the light was long and the days shorter. This monument is located on an island on a garden pond, and during the warmer autumn days is covered with lemon plants. It is in fact referred to as the Lemon Fountain. I located a spot back from the sculpture along a path framed by large hedgerows. 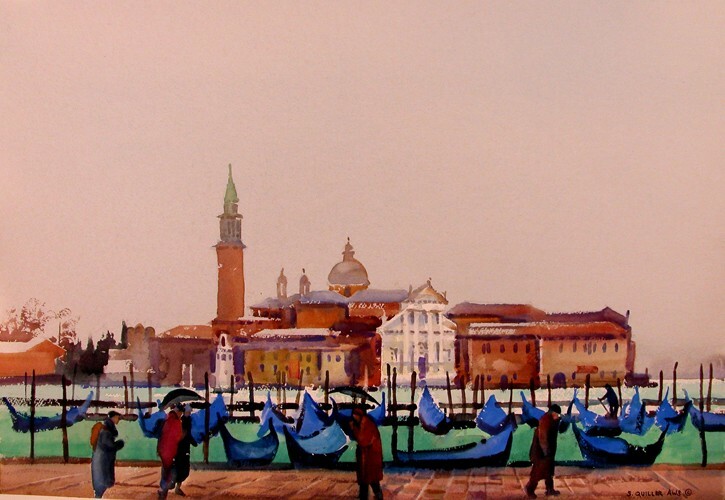 I spent time in Venice on two separate occasions in December. This second time was sunny and bright for the four painting days. I found a dock not far from the San Angelo Ferry stop where I did this painting. Looking down the canal in the afternoon the buildings were washed in sunlight. I placed a bit of the Rialto Bridge in the left hand corner to orient the composition. 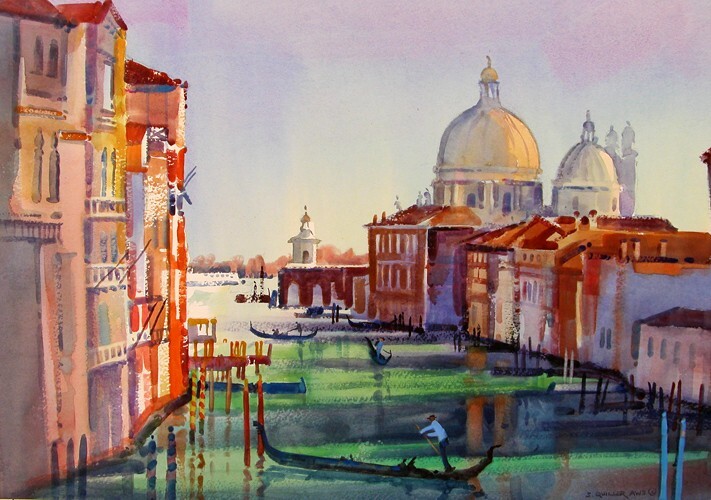 I spent time in Venice on two separate occasions in December. This second time was sunny and bright for the four painting days. I found a dock not far from the San Angelo Ferry stop where I did this painting. Looking down the canal in the afternoon the buildings were washed in sunlight. I looked across the canal to a small slice of the texture and color that is prevalent in the area. 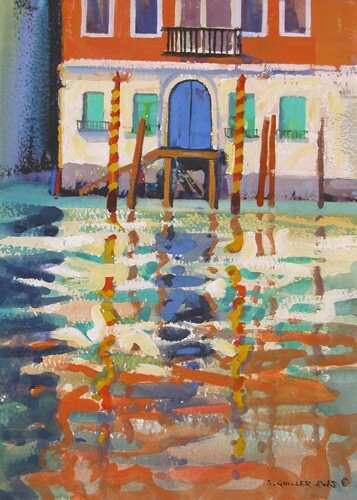 The late light and reflections were the many focal points in this work. 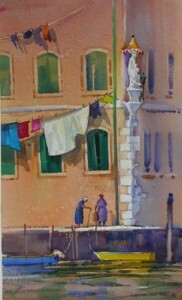 In Venice there is a discovery around every corner. From where we stayed and around a couple of corners was the Academia Bridge, one of the two major bridges across the Grande Canal after the train station stop. The bridge was very busy but I claimed my spot and really was not bothered for the entire day. At the top of the bridge the sun lasted the whole day and, except for the shadow of a pole moving across my painting, it was a good setup. Gondolas were active in this channel and it seemed a very festive place. I explored painting sites along the Grande Canal on a mid December evening. I found a nice tucked away spot by the Rialto Bridge with this view. I did a quick sketch and took some notes as to the color of the lights and where they were located, as well as the reflections in the water. Two days later I came back during the day and, looking at the actual site and referring to my sketch, I did this painting. 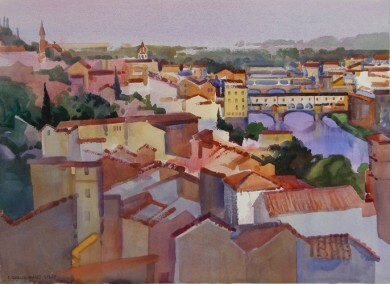 Back in Colorado in early January, with a view of the snow and frozen Rio Grande, I finished the work using some casein. 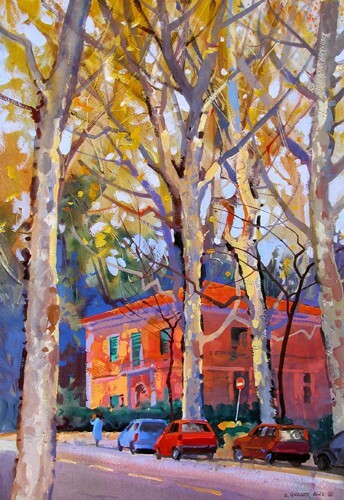 I had driven and walked along this street in Florence countless times the last few months and always marveled at the beauty of the plane trees, villas, and light and shadow patterns. I grabbed a good day in mid December and did this painting. There was still autumn color and strong, long light to work with. While doing on the painting I met the people who own this hotel, and they invited Marta and me to have coffee and view their collection. It was a beautiful place and certainly added to this experience. This is the last painting I did during our stay in Tuscany. 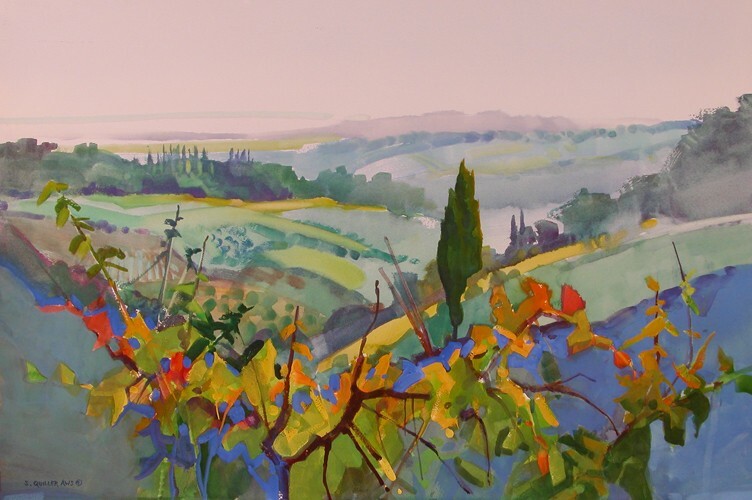 I painted this in an old olive grove above our home looking across the valley. In December the landscape has an orange cast because of the fallen leaves and dried underbrush. So I kept pushing the orange to get close to what was there. It is interesting to think back on the color and feel of this landscape in late August and September and notice how much it has changed. We spent a short time along the Cinque Terra that is five villages located about two miles apart at the edge of the Mediterranean Sea in northern Italy. These towns can be reached only by foot or by train. We were there in late October and thus avoided the traffic of the vacationers and tourists that abound during the warmer months. This view is typical of compositions that can be seen while hiking along this coast.